"Waiter, there is a dead body under our table.."
Yesterday was the first day I'd had on my return to Palm Springs, to really spend some time talking with Madelon -- reminiscing about things as we sat in her home office going through old photographs. "So many pictures" she said, as we moved another box. 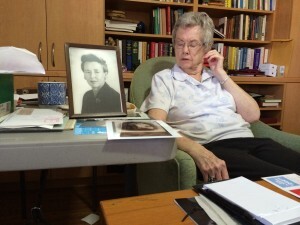 She'd found a framed picture of Mildred taken in the early 1960s and had it sitting on the side table. "Did I ever tell you the 'restaurant story'?" she asked me. "Restaurant story? No, I don't think so" I replied as I slipped into my pocket to turn on my digital recorder, and took a quick photo with my iPad. So Madelon and Ronnie went South to LA, and on their first night there they decide to go to Lowry’s (of Seasoning Salt fame) Prime Rib for dinner. Dressed nicely she said, as women did in those days, they were seated and proceeded to order a drink when Ronnie bumped something under the table and looked, turned to Madelon and calmly said “I do believe there is a body under this table, will you look?” Madelon lifts up the tablecloth and looks “Well yes there is, there is a dead man under the table. We better call the waiter.” Both of them being nurses and working in hospitals dead bodies were nothing new, and she said they were both calm and matter of fact about it. So they called the waiter over and calmly and politely said “there’s a dead man under our table.” “Are you serious?” asked the waiter. “Yes, would you mind looking young man?” The waiter bent down and according to Madelon, got up white as a sheet and ran away. The manager scurries over and says “I’m so sorry, lets get you to another table, go back there, I’ll have your drinks sent over. Do you know who he is?” “No, we don’t sorry. He’s been dead for quite some time.” So they moved to the back of the restaurant, had another drink and dinner. “That manager must have apologized a dozen times” she said. And “dinner was on the house”. “I love telling that story,” she said. "It’s the moment when Ronnie and I really bonded.” and we became great friends. I was so thrilled to know she was gay, which I knew after I met her partner – you just never said anything in those days.” Ronnie unfortunately died of a heart attack a few years later, and Madelon was tasked with taking her things from Ronnie’s apartment over to her partner’s house. Ronnie’s partner? Mildred Snyder. It was in helping Mildred through the grieving process that the two of them found each other. I can't wait to read the finished product.